"Hotel Danieli in Venice is definitely one of the Venice luxury hotels with history: it used to be high on every aristocratic traveller’s ‘Grand Tour’ itinerary"
Staying in Hotel Danieli in Venice is like living in a dream. The staff are professional and very responsive to your needs. It’s position is just perfect – steps away from the attractions. The rooftop terrace for breakfast has one of the most impressive views in the town. This is definitely one of the hotels with history: it used to be high on every aristocratic traveller’s ‘Grand Tour’ itinerary. You can read more about its history in our article Hotel Danieli Venice. Many famous love stories took place in its rooms, you can read about them in our article Venetian Hotels – Hotel Danieli Famous Love Stories. 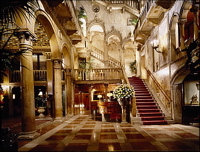 The reception area and the foyer have the wow factor – it is one of the most beautiful hotel entrances in the world. Piazza San Marco, Basilica di San Marco, Doge’s Palace and café Florian Venice are literally round the corner from Hotel Danieli in Venice, just perfect if you wish to do some sightseeing and souvenir shopping before embarking your cruise ship. The nearest Venice vaporetto, S. Marco - San Zaccaria, is just in front of the hotel. It would take you to Piazzale Roma at the end of the Venice Grand canal. From there, you can either take a Venice land taxi, a free shuttle bus (only if your cruise line provides one) or walk to Venice cruise terminal. Alilaguna’s BLU line San Marco Giardinetti stop from where you get taken straight into Stazione Marittima is just 5-10 minutes walk away. The line doesn’t run year round so check the timetable here: Alilaguna Linea BLU. Rooms in Hotel Danieli in Venice can be a bit smallish and shabby, with no view – make sure you specify your needs when making a booking. The hotel consists of three buildings: the original 14th Ct building, the 18th Ct building and the modern block. So if you would like a more recently furbished room, ask for a room in the newer block. If you’re booking a room with a lagoon view, ask for the higher floors to avoid the noise of the busy waterfront.